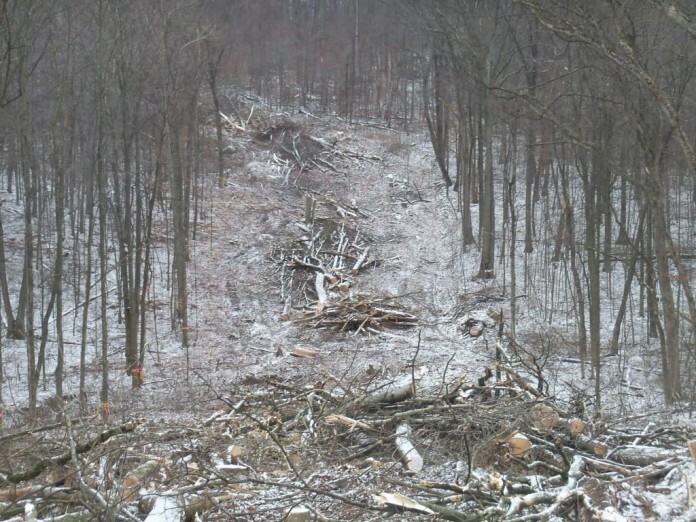 NEWARK, Ohio — A Licking County landowner decided he didn’t want a pipeline to cross his property. When he refused, Enterprise Liquids Pipeline threatened to use eminent domain proceedings to take private property for the purpose of the ATEX pipeline the company was constructing. The Licking County, Ohio, landowner fought back with the help of a nonprofit legal center and, so far, Enterprise Liquids Pipeline has not filed a lawsuit or staked the property for construction to begin. David Bonifant, a certified tree farmer within the American Tree Farm System, said he was approached in February 2012 by landman for Enterprise Liquids Pipeline. He expressed his concern over the pipeline easement plans when they included clear cutting three acres on his property. The pipeline designed called for an area 1,500 feet long containing hardwoods to be cut down. Bonifant said a 90-feet wide piece of land would be uncovered for the construction phase of the 20-inch pipeline and, after the initial construction, a 50-foot right of way would remain open permanently for aerial inspection. The ATEX pipeline is going through Ohio to connect the Appalachian region to Texas. The pipeline is designed to hold 1200 PSI, which concerned Bonifant if something went wrong with the line. “I’m not a tree hugger, but have to do it right,” said Bonifant. He said the negotiations started to break down — he refused a $5,500/acre offer — and he decided to take action when company representatives started talking about eminent domain. Bonifant started searching the Internet and discovered the 1851 Center for Constitutional Law. Clients receive free legal representation, thanks to the generosity of donors. The center researched the issue and found some court cases and case law that gives the rights back to the landowners. “It was my right as a landowner to say no,” said Bonifant. The center found that, yes, the Ohio Revised Code 1723.01 authorizes the use of eminent domain for the transporting of natural or artificial gas, petroleum, coal or its derivatives, water or electricity through pipelines. However, the center feels the Ohio Revised Code 1723.01 does not appear to apply to the ATEX pipeline, which would be carrying ethane, a “liquid” derived from the natural gas extraction process. The center also interprets the ATEX pipeline is not a “public use” because it will be transporting ethane and not petroleum or natural gas. The center also says Enterprise Liquids Pipeline is not a public utility so eminent domain could not be applied. The center has also told Bonifant that Enterprise Liquids Pipeline is not a common carrier, and if a court would decide ethane is either a natural gas or petroleum, they feel that ELP would not be determined to be a “common carrier” under the state’s definition. Bonifant and the 1851 Center for Constitutional Law claim that the ethane-carrying lines would not fit into the state’s definition of a “common carrier” because the lines are not carrying natural gas, but a natural gas byproduct. The center wrote a memorandum to the company on Bonifant’s behalf, stating there was no constitutional basis to take the Bonifant private property through eminent domain. The memo detailed why the economic benefits to private interests are not public uses and therefore eminent domain doesn’t apply in this case. The center also wrote that similar pipelines are being built in Ohio without the use of eminent domain, and there is evidence that ELP considered alternative routes that circumvent the property. ELP responded with letters from its attorneys threatening a lawsuit and eminent domain. However, construction has started on the pipeline and, as of now, the pipeline is going around Bonifant’s property.